MINNEAPOLIS -- Authorities in Minneapolis released body camera video Sunday from two police officers in the fatal shooting of a 31-year-old black man. The graphic footage shows Thurman Blevins shot from behind after a frenetic foot chase and what appeared to be a gun in his hand. Officers Justin Schmidt and Ryan Kelly were responding to a 911 call of a man firing a gun into the air on the city's north side June 23. The video shows them pulling their cruiser up and a man -- Blevins -- seated on a curb near a woman with a child in a stroller. As the officers pull up, one says, "He's got a gun!" Blevins jumps up and runs, as the officers yell "Stop, stop! Put your hands up! I will (expletive) shoot you!" 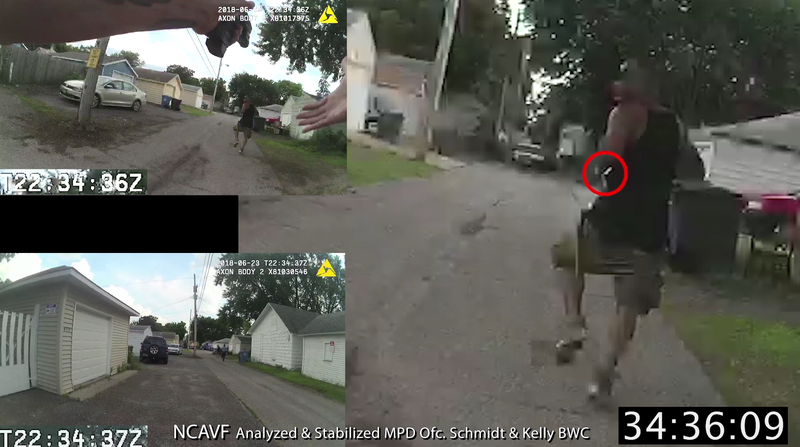 Bodycam footage released Sun., July 29, 2018, by the Minneapolis Police Department of the fatal shooting of Thurman Blevins on June 23. Minneapolis Police Dept. Community members have been calling for the release of the body camera footage since Blevins' death, CBS Minnesota reports. Minneapolis Mayor Jacob Frey promised to release the footage once the Bureau of Criminal Apprehension completed interviews with all key witnesses. The mayor said Blevins' family viewed the video about an hour before it was released publicly. He called Blevins' death "tragic," but declined to comment on what the footage showed. This is an image from bodycam footage released Sun., July 29, 2018. It's the first image of police encountering Thurman Blevins on July 23. Minneapolis Police Dept. The two officers are on paid administrative leave. Blevins' relatives previously called for both officers to face criminal charges. Chief Medaria Arradondo released a statement after the video was released, saying he could not comment while the investigation is pending. CBS Minnesota points out that the Facebook group Justice for Thurman Blevins Jr. posted a response to the release of the video, saying the video shows that "Thurman Blevins begged for his life not to be taken by the Minneapolis Police Department." Minneapolis has been rocked by two high-profile fatal police shootings in recent years, including the November 2015 shooting of 24-year-old Jamar Clark and last year's shooting of 40-year-old Justine Ruszczyk Damond. Officers in the Clark case were not charged, and trial is pending for the officer who shot Damond.